Henry Clay Murdock’s entry in the logbook of the whaling ship Nassau on June 14, 1852, began, predictably, with the weather. It was foggy and the visibility was poor that morning near the Gulf of Anadyr in the Arctic, but still a cry came out from atop the masthead: whales ahead. The deck erupted in activity, and throughout the morning sailors lowered whaleboats and pursued the monstrous prey. The crew was swift and skilled; after all, they’d been sailing the world’s oceans in pursuit of whales for almost two years. During that day and into the next, they caught three whales, which they chained alongside the Nassau and began “cutting in”—removing strips of blubber that could weigh upwards of a tonne with long-handled cutting spades. To complete his journal entry, Murdock took a wooden stamp carved in the likeness of a bowhead whale, dipped it in ink, and stamped three whales below the day’s notes. 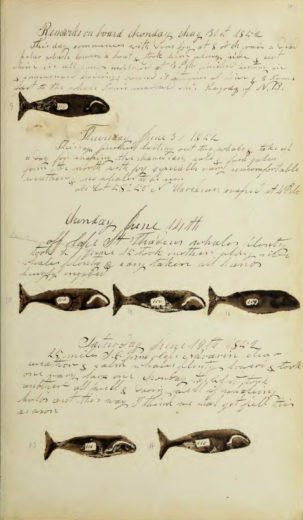 A page from the log kept by Henry Clay Murdock, mate of the ​whaling​ ship Nassau, shows how he used carved whale stamps to depict the whales caught in the Arctic in June 1852. Image ODHS#614, Courtesy of the New Bedford Whaling Museum, New Bedford, MA. Using the stamps, a ship’s owner or his agent could scan the logs to quickly tally whales seen (usually denoted by a stamp of a whale’s tail flukes) and killed (a stamp showing the full body). Marginal notes as to whether it was a bull, cow, or calf, and details such as “sunk,” “cut adrift,” or even the gruesome “lost spouting blood,” were also often included. Some ships had a collection of stamps, one for each species they’d predictably see, most often bowhead, sperm, or right whales. As well, many of the stamps had a small space where the mate would later record the number of barrels of oil derived from each catch. (By the 1760s, most American whaling ships had ovens called “try-works” installed on deck, enabling them to boil whale blubber at sea, rendering it into oil that would be stored in barrels. “This is one of the technologies that really set the stage for American dominance in whaling,” says Dyer.) The whales caught by the Nassau crew on June 14 yielded 100 barrels of oil each, as Murdock would later note in the log. It’s likely that Murdock carved his own stamps, but anyone on board could do so with the right supplies. And not much was required. Most stamps were carved of wood, although bone and ivory were also used. Some stamps were multisided with two or three images on one implement; others had embellished handles or even spinning mechanisms. Today, many of the logbooks preserved in museums, archives, and private collections include stamps, although their use certainly wasn’t standardized or ubiquitous. “Plenty of logbooks have no stamps in them,” says Dyer, adding that to get any data out of the stamp-free books, owners would have to comb through them, page by page, entry by entry. Compared to many logs, with crimped, illegible text, Murdock’s logbooks must have been a relief for anyone, including contemporary archivists and historians, trying to glean information from them. His prose is fairly clear despite the dearth of punctuation and capital letters, and his entries are all business: short and to the point. A few of Murdock’s contemporaries, however, elevated the whaling vessel journal to an art form. Most outstanding are the logs of Washington Fosdick, mate on the Saratoga. He lavished his script with flourishes and curlicues and meticulously recorded whale captures, but he also embellished the margins with detailed sketches of ships seen en route as well as profiles of islands, mountain ranges, and the occasional human community. While the journals of Murdock, Fosdick, and others speak to a trait that is inherently human—the will to create art, even for the most mundane of tasks—it also speaks to a fundamental tenet of modern business: data is king. 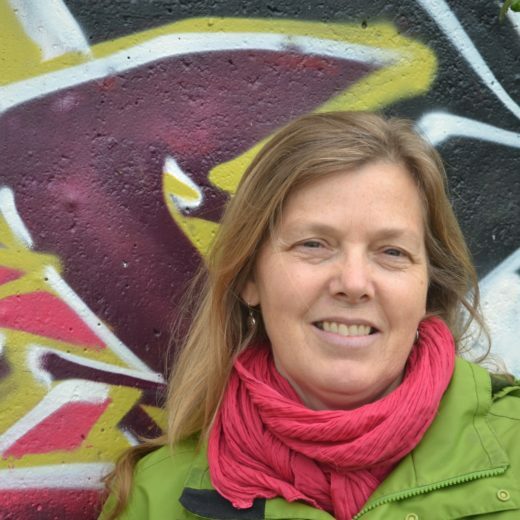 Cite this Article: Adrienne Mason “Art and Accounting in the Age of Whaling,” Hakai Magazine, Aug 8, 2016, accessed April 23rd, 2019, https://www.hakaimagazine.com/article-short/art-and-accounting-age-whaling/. The first Japanese person to live in the United States, Manjirō’s incredible journeys are seafaring legend.